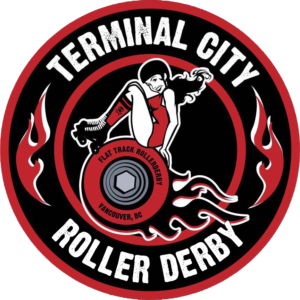 Over the past several years, Terminal City (and roller derby in general) has been moving towards being more inclusive to people of all gender expressions. This process includes using gender neutral language. For instance, in the past, where we might have called to a tripod of blockers “Take her to the line, ladies!” we now say something like, “Take them to the line, skaters!” This move aligns with WFTDA’s stance on gender and is one simple but meaningful step we can take in making our community more inclusive to all. So, now, welcome to the 2019 season of….